Yes we have the last two emperors of this collapse of the Roman Empire – Diocletian and his co-emperor Maximianus. The hoard we purchased that was discovered in England was clearly a crisis hoard that someone buried and did not survive to retrieve it. 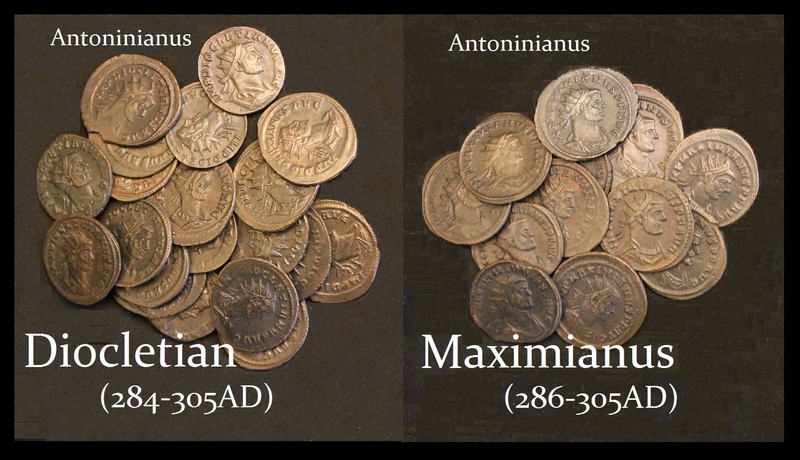 The last two emperors in the hoard were Diocletian and Maximianus. The fact that this hoard contained the debased coinage demonstrates that aside from inflation, which is NOT an incentive to save, there was also such political instability that people could not trust banks either. This hoard of several thousand coins was thus an important documentary find. Since Britain was part of the Gallic empire between 259-274AD, the fact that such coins are intermixed with Roman is fascinating. The fact that these are the last two emperors implies this is about when the hoard was buried. « Gold – the Desirable Object – Can it Survive as the Alternative to Electronic Money?